Spain’s worst political crisis in a generation comes to a head on Tuesday as Catalonia’s leader could declare independence from Madrid in a move likely to send shock waves through Europe. Whether or not Carles Puigdemont will follow through on his threat to announce a full breakaway — defying the central government and Spanish courts — is still a mystery. At stake is the future of a region of 7.5 million people, one of Spain’s economic powerhouses whose independence drive has raised concern for stability in the European Union. Puigdemont, a 54-year-old former journalist and life-long independence advocate, will address Catalan lawmakers in an extraordinary parliamentary session beginning at 1600 GMT. Political leaders in Catalonia, Spain and Europe have urged Puigdemont to stand down and ease the country’s biggest upheaval since its transition to democracy in the 1970s. But the Catalan president says an independence referendum that took place on October 1 despite a court ban ruling it unconstitutional justifies splitting from Madrid. Around 90 percent of those who cast ballots voted for independence but the poll was poorly monitored and many Catalans opposed to secession simply stayed at home. Deputy prime minister Soraya Saenz de Santamaria warned on the eve of Puigdemont’s address that any secession declaration “will not go unanswered by the government”. The front page of Catalan daily El Periodico called Tuesday “the end of the road”. 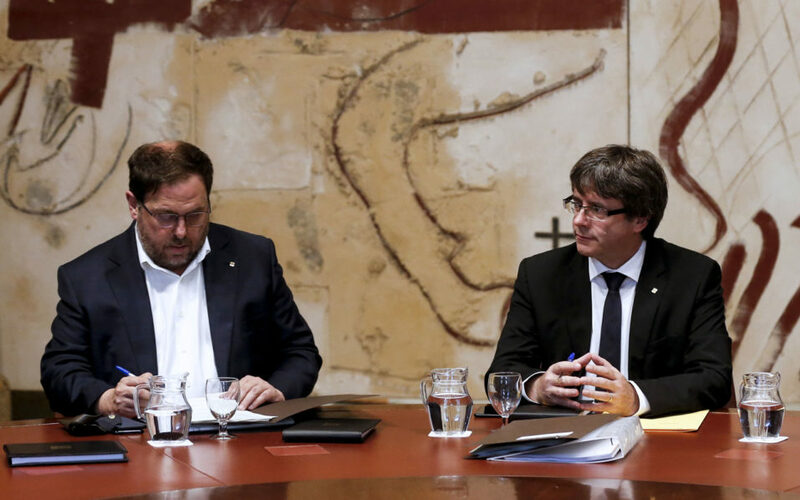 Catalan separatists have come under intense pressure both at home and abroad to halt plans to break away from Spain. On Monday evening, Ada Colau, the popular mayor of Barcelona, warned a unilateral declaration of independence would put “social cohesion” at risk. The results of the referendum “cannot be an endorsement to proclaim independence but they constitute the possibility of opening a dialogue and international mediation”, she said. Pressure also came from the street itself, with hundreds of thousands of pro-unity demonstrators marching through Barcelona and Madrid at the weekend. Their slogan, “Basta!”, was simple: “Enough”. Puigdemont vowed following the disputed referendum that he would declare independence in the coming days but he has a variety of hands to choose from. Short of declaring an outright split, the Catalan leader could play for time and call for dialogue, or back down outright from his secessionist demands. Madrid insists that any independence declaration would not change the legal reality that Catalonia is one of Spain’s semi-autonomous regions with laws governed by the national constitution. But EU nations are watching developments closely amid concern that Catalan independence could put further pressure on the bloc still dealing with the fallout from Brexit. Catalan police were out in full force in Barcelona on Tuesday morning around the region’s parliament building ahead of Puidgemont’s address. Prime Minister Mariano Rajoy has vowed to use everything in his legal power to prevent Catalan independence and has even refused to rule out imposing direct rule over the region from Madrid — a move many fear could lead to unrest. The crisis has caused deep uncertainty for businesses in one of Spain’s wealthiest regions. The head of Spain’s chamber of commerce Jose Luis Bonet told Cadena SER radio that a unilateral independence declaration “would be a disaster”. “For Spain it would be extraordinarily negative and even for Europe it would mean enormous instability,” Bonet said.